For most of its history, Korea was an independent kingdom, or at least an autonomous kingdom under Chinese influence. This came to an end in 1910, when Japan annexed all of Korea. At the end of World War II in 1945, the 38° parallel was established as the dividing line between U.S. and Soviet zones of occupation, and in 1948 separate civil administrations were established in the two halves of the country. The Korean War (1950-53) ended in a draw, with the armistice line falling close to the prewar 38° line. The Republic of Korea (ROK), commonly called South Korea, occupies the Korean peninsula south of the armistice line. 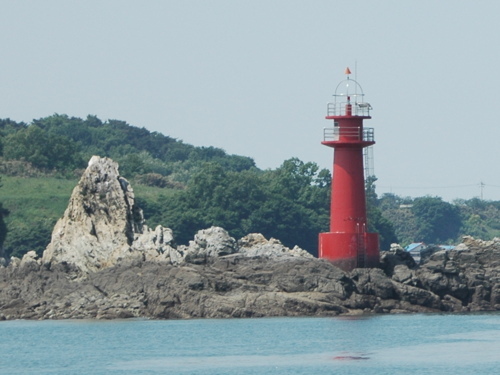 This page covers lighthouses of islands lying southwest of Incheon off South Korea's northwest coast, including the three townships of Deokjeok, Jawol, and Yeongheung. This coast faces west on the Yellow Sea. It is an intricate and rocky coast, with numerous islands of all sizes offshore. Although there are several famous and historic lighthouses on this coast, most of the more modern lights are not well known. Following several recent government reorganizations, navigational aids in the ROK are now regulated by the Ministry of Oceans and Fisheries (MOF). In this area, the lights are maintained by the Incheon Regional Maritime Office of Oceans and Fisheries. 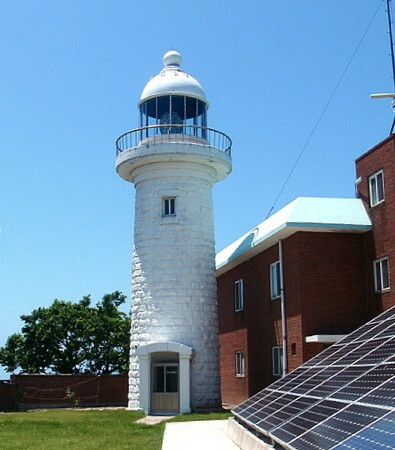 MLTM also operates the major coastal lights, but management of harbor lighthouses is in the hands of local port authorities. In Korean the word for a lighthouse is deungdae (등대); dan is a cape, do is an island, and hang is a harbor . KAAN is the Korean Association of Aids to Navigation. Small photos and basic data, all in Korean. Note: Uldo is one of the outermost of the Incheon Bay islands, about 65 km (40 mi) southwest of Incheon. Date unknown. Active; focal plane 231 m (758 ft); white flash every 6 s. 9 m (30 ft) round white concrete tower mounted on a round concrete base. A photo is at right, Kim Byeon-sun has a closeup photo, a blogger has a photo in a report on a visit, Naver has a satellite view, and Google has an indistinct satellite view. Located on the highest point of the island. Accessible by a challenging hiking trail. Site open, tower closed. Admiralty M4155; NGA 17892. 2004. Active; focal plane 15 m (49 ft); red flash every 6 s. 11 m (36 ft) round cylindrical concrete tower, painted red. A photo (halfway down the page) of the two breakwater lights is available, Naver has a satellite view, and Bing has a satellite view. Located at the end of the west breakwater of Uldo harbor, on the north side of the island. Accessible by walking the pier. Site open, tower closed. Admiralty M4155.2. Date unknown. Active; focal plane 15 m (49 ft); green flash every 6 s. 11 m (36 ft) round cylindrical concrete tower, painted white. A photo (halfway down the page) of the two breakwater lights is available, Naver has a satellite view, and Bing has a distant satellite view. Located on the detached east breakwater of Uldo harbor. Accessible only by boat. Site open, tower closed. Admiralty M4155.3. Date unknown. Active; focal plane 15 m (49 ft); two white flashes every 5 s. 24 m (79 ft) tower, painted black with one red horizontal band. A black-and-white photo is available, but the light is not seen clearly in Google's satellite view. Located on a rock off the northwestern tip of Uldo. Accessible only by boat. Site open, tower closed. Admiralty M4155.1; NGA 17858. 2007. Active; focal plane 12 m (39 ft); six quick white flashes followed by one long white flash every 15 s. 20 m (66 ft) round concrete tower, upper half painted yellow, lower half black. No photo available but Google has a distant satellite view; the light is also seen in Naver's satellite view. Located on a reef about 1 km (0.6 mi) south of Jido, an island north of Uldo. Accessible only by boat. Site open, tower closed. Admiralty M4155.35. 2001. Active; focal plane 16 m (52 ft); two white flashes every 10 s. 16 m (52 ft) tower, painted black with one red horizontal band. No photo available but Bing has a distant satellite view. Located on a rock about 5 km (3 mi) northeast of Uldo and 2 km (1.25 mi) south of Seunggapdo. Accessible only by boat. Site open, tower closed. Admiralty M4149.3; NGA 17895. Date unknown. Active; focal plane 50 m (164 ft); white flash every 5 s. 9 m (30 ft) white concrete tower. No photo available but Google has a distant satellite view. Located on a promontory on the east coast of Seunggapdo. Site status unknown. Admiralty M4155.6; NGA 18044. 2001. Active; focal plane 13 m (43 ft); two white flashes every 10 s. 8 m (26 ft) round cylindrical concrete tower with gallery, painted black with one red horizontal band. No photo available and Google's satellite view does not show the tower. Located on an isolated rock about 4 km (2.5 mi) northwest of Baegado. Accessible only by boat. Site open, tower closed. Admiralty M4150; NGA 17920. 2010. Active; focal plane 17 m (56 ft); two white flashes every 5 s. 20 m (66 ft) round cylindrical concrete tower with gallery, painted black with one red horizontal band, mounted on a round concrete pier. A closeup photo is at right, Naver has a satellite view and Bing also has a satellite view. Located about 400 m (1/4 mi) off the south point of Gakheuldo, a small island about 15 km (9 mi) southwest of Deokjeokdo. Accessible only by boat. Site open, tower closed. Admiralty M4155.5. Date unknown. Active; focal plane 34 m (112 ft); white flash every 6 s. 7 m (23 ft) round white concrete tower. No photo available but Google has a distant satellite view. Located on a small island off the southern tip of Gakheuldo. Accessible only by boat. Site open, tower closed. Admiralty M4155.4; NGA 17924. Date unknown. Active; focal plane 14 m (46 ft); three green flashes every 7 s. 10 m (66 ft) round concrete tower, painted green. No photo available but Naver has a satellite view; Google has a distant satellite view. Located about 200 m (220 yd) offshore near the southernmost point of Deokjeokdo. Accessible only by boat. Site open, tower closed. Admiralty M4149.15. 2006. Active; focal plane 13 m (43 ft); two white flashes every 5 s. 16 m (52 ft) round concrete tower, painted with black and red horizontal bands. No photo available but Bing has an indistinct satellite view. Located about 3 km (2 mi) off the south coast of Deokjeokdo. Accessible only by boat. Site open, tower closed. Admiralty M4149.25. Date unknown. Active; focal plane 13m (43 ft); two white flashes every 10 s. 18 m (59 ft) round tower, painted black with one red horizontal band. A distant view (3/4 the way down the page) is available and Bing has an indistinct satellite view. Located on a shoal a short distance off the southwestern point of Deokjeokdo. Accessible only by boat. Site open, tower closed. Admiralty M4149.2; NGA 18049. 2003 (station established 1934). Active; focal plane 172 m (564 ft); white flash every 12 s. 19.5 m (64 ft) round cylindrical concrete tower with lantern and gallery attached to a 2-story concrete staff building. Lighthouse painted white. Additional keeper's houses and other light station buildings. A photo is at the top of this page, additional photos (halfway down the page) are available, Naver has a satellite view, and Bing has a good satellite view. This is the highest lighthouse in South Korea. Light lists describe the tower height as 9.5 m (31 ft), but this refers to the original lighthouse, which was demolished. 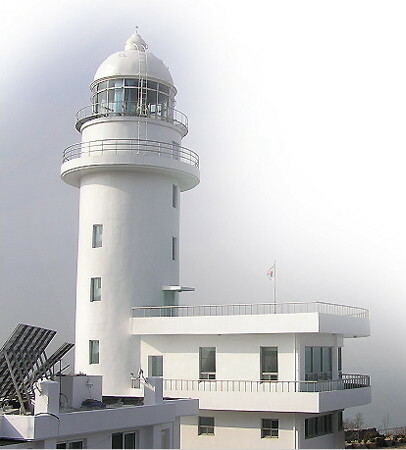 This lighthouse is the landfall light for Incheon, the largest port of Korea's west coast. Located at the western tip of Sunmido, an island off the northwestern corner of the much larger island of Deokjeokdo. Accessible only by boat and a hiking trail. Site open, and the tower may be open as well. Admiralty M4148; NGA 18040. Date unknown (station established 1964). Active; focal plane 11 m (36 ft); red flash every 4 s. 7 m (23 ft) round cylindrical concrete tower mounted on a square concrete base. Entire lighthouse is red. A closeup photo (first photo on the page) is available, Bing has a satellite view, and Google has a distant satellite view. Located on the north breakwater of Deokjeokdo harbor, on the northeast side of the island. Accessible by walking the pier. Site open, tower closed. Admiralty M4149; NGA 18048. Date unknown. Active; focal plane 15 m (49 ft); two red flashes every 6 s. 16 m (52 ft) round concrete tower, painted red. A photo is at right, a portfolio of photos and another photo (first photo on the page) are available, Naver has a satellite view, and Bing has a distant satellite view. 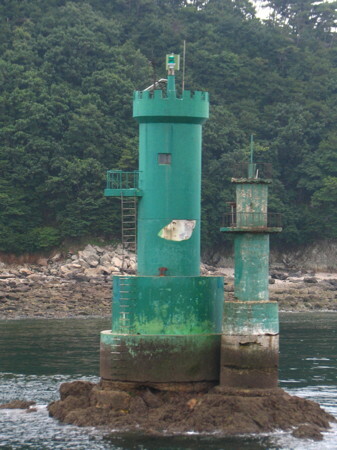 Located off the southwestern tip of Deokjeokdo, marking the entrance to a narrow inlet between that island and the neighboring island of Soyado. Accessible only by boat. Site open, tower closed. Admiralty M4149.1; NGA 18051. Date unknown. Active; focal plane 12 m (39 ft); red flash every 4 s. 12 m (39 ft) round concrete tower, painted red. A photo (second photo on the page) is available and Naver has a satellite view. This light may have been removed, since Google's satellite view shows bridge construction in the area. Located off a promontory on the south side of the inlet between Soyado and Deokjeokdo. Accessible only by boat. Site open, tower closed. Admiralty M4149.4; NGA 18050. Date unknown. Active; focal plane 24 m (79 ft); white flash every 4 s. 10 m (33 ft) octagonal cylindricl white concrete tower. A photo (third photo on the page) is available, Naver has a satellite view, and Bing has a satellite view of the station. Located on the southeastern tip of Soyado. Site status unknown. Admiralty M4168.5; NGA 18052. Date unknown. Active; focal plane 18 m (59 ft); two white flashes every 5 s. 21 m (69 ft) round concrete tower, painted with black and red horizontal bands. No photo available and the light is barely visible in Google's satellite view. Located on an isolated rocky islet about 8 km (5 mi) north of the entrance to Daesan Bay. Accessible only by boat. Site open, tower closed. Admiralty M4157; NGA 17896. Date unknown. Active; focal plane 34 m (112 ft); 13 m (43 ft) octagonal cylindrical white concrete tower with gallery. A photo is available and Bing has a satellite view. Located atop a small island off the northwestern end of Ijakdo. Accessible only by boat. Site status unknown. Admiralty M4168; NGA 18056. Date unknown. Active; focal plane 15 m (49 ft); green flash every 4 s. 14 m (46 ft) round concrete tower, painted green. Shim JaeHee's photo is at right, another photo is available (halfway down the page), Naver has a satellite view, and Google has an indistinct satellite view. An older, much smaller light stood next to the current light, but a 2010 photo (eighth photo on the page) shows that the smaller tower was removed sometime in 2009-10. Located on the northwestern tip of Ijakdo, an island about 7 km (4.5 mi) east southeast of Deokjeokdo. Accessible only by boat. Site status unknown. Admiralty M4170; NGA 18060. Date unknown. Active; focal plane 13 m (43 ft); red flash every 5 s. 16 m (52 ft) round concrete tower, painted red. A 2010 photo (seventh photo on the page) is available, Naver has a satellite view, and Google has a distant satellite view. Located on an islet about 4 km (2.5 mi) northwest of Budo. Accessible only by boat. Site open, tower closed. Admiralty M4170.4; NGA 18062. Date unknown. Active; focal plane 12 m (39 ft); two white flashes every 10 s. 13 m (43 ft) round tower, painted black with one red horizontal band. No photo available but Bing has an indistinct satellite view. Located on a reef about 1 km (0.6 mi) north of the southern islands of Jawol township. Accessible only by boat. Site open, tower closed. Admiralty M4170.2; NGA 18063. Date unknown. Active; focal plane 26 m (85 ft); white flash every 6 s. 9.5 m (31 ft) round white concrete tower. No photo available but Naver has a satellite view and Bing has a distant satellite view. Located on a small island just off the west end of Jawoldo. Accessible only by boat. Site open, tower closed. Admiralty M4169; NGA 18064. Date unknown. Active; focal plane 10 m (33 ft); red flash every 5 s. 14 m (46 ft) round tower, painted red. A photo and a small photo are available but the islet is barely visible in Google's satellite view. This light and the next one frame a passage southeast of the island of Jawoldo. Located on a reef about 1 km (0.6 mi) south of Jawoldo. Accessible only by boat. Site open, tower closed. Admiralty M4163.5; NGA 18063.5. Date unknown. Active; focal plane 12 m (39 ft); three green flashes every 7 s. 16 m (52 ft) round tower, painted green. No photo available but Google has a distant satellite view. Located on a reef about 2.5 km (1.5 mi) southeast of the Wolamdo light. Accessible only by boat. Site open, tower closed. Admiralty M4163.7; NGA 18063.7. Date unknown. Active; focal plane 14 m (46 ft); two white flashes every 5 s. 15 m (49 ft) round tower, painted black with a red horizontal band. No photo available but Google has a satellite view. Located on a reef about 7 km (4.5 mi) northwest of Chawoldo. Accessible only by boat. Site open, tower closed. Admiralty M4169.7; NGA 18069. Date unknown. 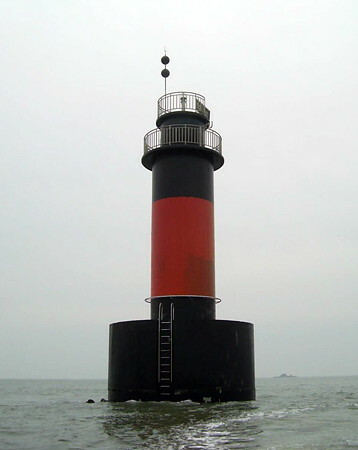 Active; focal plane 17 m (56 ft); two white flashes every 5 s. 19 m (62 ft) round cylindrical concrete tower with gallery, painted black with one red horizontal band, mounted on a round concrete pier. A photo is available but the tower does not appear in Bing's satellite view. Located on a reef in the northern approach to Pyeongtaek. Accessible only by boat. Site open, tower closed. Admiralty M4158.2; NGA 17940. 1904. Active; focal plane 42 m (138 ft); white flash every 15 s. 12 m (39 ft) round stone tower with lantern and gallery, attached to a keeper's house. 3rd (?) order Fresnel lens in use. Lighthouse painted white. 2-story red brick administration and coast guard building. Fog horn (one blast every 40 s). Sanyu Hwa's photo is at right, a blog reporting a 2012 visit has photos, another blog has photos from a 2010 visit, and Google has a good satellite view. The original lantern is displayed outside the National Lighthouse Museum in Homigot (see the Pohang Area page). A new and more powerful lens, installed in 2001, increased the range of the light to 50 km (30 mi). Located on a small island at the eastern end of the Deokjeok chain. Accessible only by boat. Site status unknown. Admiralty M4158; NGA 17932. Date unknown. Active; focal plane 15 m (49 ft); six quick white flashes followed by one long white flash every 15 s. 19 m (62 ft) round concrete tower, upper half painted yellow, lower half black. A distant photo (last photo on the page) is available and Google has a distant satellite view. Located on a reef about 1.2 km (3/4 mi) east of Budo. Accessible only by boat. Site open, tower closed. Admiralty M4158.1. Date unknown. Active; focal plane 12 m (39 ft); green flash every 5 s. 16 m (52 ft) round concrete tower, painted green. No photo available but Google has a satellite view. Located on a rock about 5 km (3 mi) northeast of Bu Do. Accessible only by boat. Site open, tower closed. Admiralty M4163; NGA 17934. Date unknown. Active; focal plane 18 m (59 ft); two green flashes every 6 s. 14 m (46 ft) round concrete tower, painted green. No photo available but Bing has a satellite view. Located on a rock off the southwestern tip of Yeongheungdo. Accessible only by boat. Site open, tower closed. Admiralty M4164; NGA 17944. Date unknown. Active; focal plane 17 m (56 ft); red flash every 6 s. 17 m (56 ft) round tower with lantern and gallery mounted on a circular platform supported by three piles. Lighthouse painted red. No photo available. Located on a shoal at the north end of the Yeongheungdo group. Accessible only by boat. Site open, tower closed. Admiralty M4165; NGA 17954. Date unknown. Active; focal plane 18 m (59 ft); red light occulting once every 4 s. 15 m (49 ft) round tower with gallery, painted red, mounted on a platform supported by tripod piles. No photo available but Google has a satellite view. Located on an isolated rock about 8 km (5 mi) east southeast of the Seo Sudo lighthouse. Accessible only by boat. Site open, tower closed. Admiralty M4164.5; NGA 17956.5. Date unknown. Active; focal plane 18 m (59 ft); two white flashes every 5 s. 14 m (46 ft) round tower with gallery, painted black with one red horizontal band. A photo is available and Google has a satellite view. Located on an isolated rock about 9 km (4.5 mi) east of the Seo Sudo lighthouse. Accessible only by boat. Site open, tower closed. Admiralty M4166; NGA 17956. Posted February 4, 2008. Checked and revised March 5, 2019. Lighthouses: 35. Site copyright 2019 Russ Rowlett and the University of North Carolina at Chapel Hill.